This is the story of Fairminded Fran and her experience in learning about community cats (also known as feral cats). On her journey Fran hopes to convince Selfish Sam to help with the cats. But Sam cares only for himself. She also asks Naive Nancy to get involved. But Nancy doesn't want to make waves, so she always goes along with the crowd. Join Fairminded Fran as she learns about cats that live outdoors and that can't usually be tamed. Learn important facts about community cats. Think about how their numbers affect the earth. Think about how we can work together to humanely stop the spread of community cats and reduce suffering. Think along with Fairminded Fran. Visit Fairminded Fran and the Three Small Black Community Cats Official Website...Click Here! 544M Fairminded Fran & the Three Small Black Community Cats $6.45	 Qty. What People are Saying About Fairminded Fran and the Three Small Black Community Cats . . . If you’ve ever spotted a feral cat in your neighborhood and weren’t sure what to do, this would be a great picture book to read with your kids. Fran, a little girl, spots wild cats near her elementary school. Not all the other kids want to help them, but Fran is determined. First she feeds them. Then, she learns about a catch neuter and release program for feral cats. Her compassion helps to bring the other kids around. This bonus idea is for anyone who notices feral cats in their community. You don’t have to catch the wild cats yourself either. Many communities have volunteers that will do that if they know about the wild cats. It’s an effective and humane program. "FAIRMINDED FRAN and the three small black COMMUNITY CATS", is superb reading for all elementary grades. The book is right in line with the Common Core Learning Standards: authentic text, application to a real world situation and high student engagement. The topic will make an excellent research project! The book will be an excellent addition to individual classroom libraries. I thoroughly enjoyed it! Along with Fairminded Fran, kids meet Selfish Sam, and Naive Nancy, who have differing opinions on these cats. Critical thinking is used to determine the right way to handle this situation.Fairminded Fran and the Three Small Black Community Cats would be a great classroom resource, not only to let kids know about feral cats, but also to encourage the process of critical thinking. I highly recommend it. “Fairminded Fran and the three small black Community Cats” is a great read for anyone who values compassion. Delving into the complexities of how we, as a society, have historically dealt with cat overpopulation the book highlights effective and ethical solutions currently being applied by young enthusiastic problem solvers like Fran. The book wonderfully illustrates how people can gather together to make their neighborhood a kinder place. “Bravo! Fairminded Fran and the three small black Community Cats is an informative story that will teach children how to think critically about a very important and real-world topic that surrounds us all – feral cats. As a teacher of over 20 years, I know that critical thinking must be taught in order to move students into deeper levels of reading and comprehension. Fairminded Fran does this. Children will engage in meaningful discussions, make personal and world connections, ask questions, make inferences, evaluate characters, problem solve, and apply what they have learned to help their own communities – “powerful” thinking tool! I especially like how each character is identified as having a distinctly different personality and thought pattern. It makes readers reflect on their values and ethics as well as recognize their own metacognitive abilities, and this will promote change for the better in so many ways. Finally, as a supporter of animal rescue, I give Fairminded Fran two paws up! There can never be enough stories about rescuing animals. We are their voice – well done! 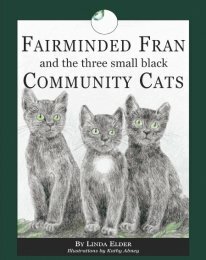 Fairminded Fran and the three small black Community Cats is one of the only books that I have come across to directly address the issues surrounding and needs of feral cats. Fairminded Fran learns the importance of empathy when trying to help these cats that she discovers behind her school. This book will be a great resource for young people to learn about the needs of feral cats, why many cannot be re-homed and how we can help them. The information at the end of the book regarding feral cats and ways of thinking is a good additional resource. There are many wonderful children books written about homeless animals. Usually, the book has a happy ending and the animal ends up in a loving home. So how do you tell the story of animals that don’t end up in a home but still have a happy ending? Humane Society of West Michigan. Fairminded Fran and the three small black Community Cats is a well-written children's book that helps illustrate one child's life experience that leads her to act in a fair-minded way. When confronted with the cats that are in desperate need of care and attention, the child engages empathizes with the point of view of the community cats. … she quickly learns that the feral cats live in a much different situation than she had assumed to be true. While this is upsetting at first, she is fairminded and continues to pursue a solution for the community cats. As she seeks to know more about the cats by asking adults around her for information, and by doing research, Fran shows her thinking to be flexible; her understanding of what the cats really need soon shifts. This is a great book to use for launching the notion of the three thinkers; Fairminded Fran, Selfish Sam and Naive Nancy that exist within all of us. When we teach children to recognize these types of thinking, they have tools for better understanding the quality of their thinking. Fairminded Fran and the Three Small Black Community Cats is a fantastic book and covers so much wonderful information in such a readable format. I would definitely recommend it to any humane educator or others interested in starting, continuing or educating others about our nation/worldwide problem of feral/community cats. "Fairminded Fran" covers all the basics and then some of TNR and the continuing care of the cats.